September 27, 28, 2013 Mark Your Calendar! | Lift Jesus' Cross! September 27, 28, 2013 Mark Your Calendar! Posted on August 8, 2013	by Lift the Cross of Jesus! If I could, I’d find one of those icons that jump up and down and bounce at the top of your screen. I’m so excited to share this upcoming harvest event with you! African evangelists Reinhard Bonnke and Daniel Kolenda will preach together in OUR NATION on September 27 and 28 at AMWAY center in Orlando, Florida! AMWAY is where the Orlando Magic Basketball team plays basketball. Together, these men have seen more than 70 MILLION people born again in Africa. That’s a lot of people. What do you think America would look like if 70 MILLION Americans gave their hearts to Jesus Christ? For 50 years, Reinhard Bonnke’s cry was, “All of Africa shall be saved!” Now, in his 70’s, Evangelist Bonnke feels the Lord spoke to him, “It’s America’s time.” Come on, get your faith notched up because GOD is on the move in AMERICA! In July, I was honored to talk to Evangelist Daniel Kolenda, Reinhard Bonnke’s successor to lead Christ for All Nations and to lead the campaign trail to evangelize all of Africa. 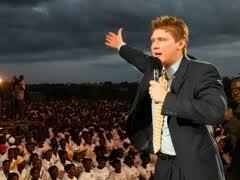 Daniel has preached to millions and he has seen God touch lives with the POWER of the good news. 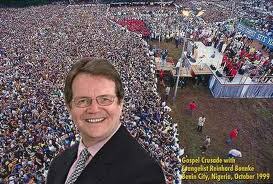 Daniel told me that today Reinhard Bonnke is focused on America. I know I have readers from Asia, Europe, and Australia, and I hope you will bear with me as I want to BUST because, my friends, the Captain of our Salvation is bringing many sons and daughters to glory! And He’s coming HERE, to America! This entry was posted in Prepare for Emergencies and tagged All of Africa shall be saved, born again, cross, cross of jesus, Daniel Kolenda, Evangelism, evangelists, harvest, Reinhard Bonnke, revival, September 27. Bookmark the permalink. 7 Responses to September 27, 28, 2013 Mark Your Calendar! Don’t miss this event coming to Orlando, Florida in September! The Prayer Revival of 8157, also called the Businessmen’s Revival or Layman’s Revival, happened in similar circumstances as we have today. That era of Americans suffered a deep recession, deep political divides, a looming Civil War, cold religion, and spiritual naysayers. The revival hit because one man, Jeremiah Lanphier, heard God’s voice and obeyed it. The estimated results were that 6% of Americas were converted by the revival. The revival even continued in the Southern armies during the Civil War with prayer meetings being held at night. The Prayer Revival was one of the main reasons the Southern states ended up becoming today’s Bible Belt, with America’s greatest percentage of Christians located there. Now, the Prayer Revival did not prevent the horrendous bloodshed of the Civil War where over 600,000 Americans died, but I believe it prepared people to go through it and then survive the aftermath. Whatever reasons God has for bringing Bonnke and Kolenda to America now to preach revival to us, praise God, I’m all for it! Larry, you mean 1857, right? 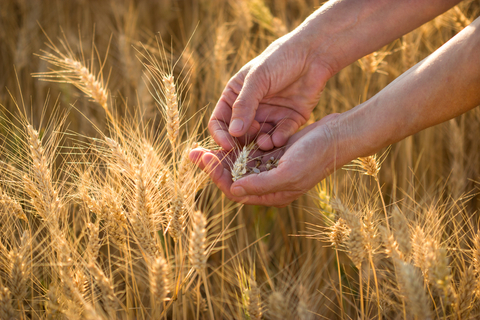 I think one of the best things that we can do to prepare for this harvest is to share what God did in previous harvests. THANK YOU for taking the time to write this accurate account of the Layman’s Revival in the 1800’s. OK, I have a confession to make. Regarding those bobble heads? I have 3 of the on my van’s dashboard. 🙂 One is a duck from my hometown favorite store, Christmas Tree Shoppe, and one from Germany where I visited my new baby granddaughter last December, and one from Ocean CIty, Maryland where we took my mother for a Mother’ Day weekend. So there you have it–Hope’s into the real, physical, cool bobble heads, too! This is way off subject,but McDonalds had one years ago that was purple and wiggled from head to toe. My girlfriend had one in her van and it entertained me on our homeschool trips! Amen, sister! May the Lord bring it on! Share the news with friends! And remember, you can also provide a video with the gospel to your friends and neighbors in your own home through Billy Graham’s Hope for America DVD s well as one I will tell you about soon–Greg Laurie’s DVD on healing hurting hearts. May the gospel go forth, not in words only, but in demonstration of the POWER of JEHOVAH GOD to change a human being’s soul forever! YAY!!! Goodness, I need one of those bouncy things on the top of this screen! HA! 70 million would be a little under a 1/4 of our populaton, and about 1/3 of the adult population. Saved in short period of time? Glorious. We may be ripe for a revival, something I’ve been praying for for years. I’ve also been praying for the rest of the English speaking world. We once were the bearers of the Gospel for the whole world, now we’re falling off that. The UK used to be the number one sender of missionaries, then we became first and them second. Now South Korea is second. We’re still first, but for how long? A revival would do wonders for the whole world. Let the Spirit of revival fall on us!!! I love people who are comfortable with numbers! No kidding. I get a bit dyslexic with numbers and tend to forget them or get them turned around. I had no idea 70 million would be a little less than 1/4 of our population. Very soon we will stand before God on Judgement Day and he will separate the sheep from he goats, the rebellious from the obedient,the confessors of Christ from those who rail against him. We need HARVEST! I feel like we’ve been required to live in a bit of a sewer the last decade or so. The Bible says that the sin will “vex the souls” of the righteous. Amen to that! But I think of all the people, those 20 somethings that I saw in the Valley of Decision, people who need the Lord. Some people are still searching for truth, life, and love. Let’s lift up the cross!